If you are an EFILE service provider, you can use ReFILE to send T1 adjustments online for tax years 2015, 2016, 2017, and 2018 on behalf of your clients. The ReFILE service lets you change the same lines that individual taxpayers can with the "Change my Return" service in "My Account". What tax years does ReFILE support? ReFILE is supported for 2015, 2016, 2017, and 2018 tax years with the latest ProFile version (2016.4.3 or later). Please see the "Frequently Asked Questions" section at the bottom of this article for more information. Click here to read the CRA's "ReFile: Online adjustments for income tax and benefit returns" article. 2. 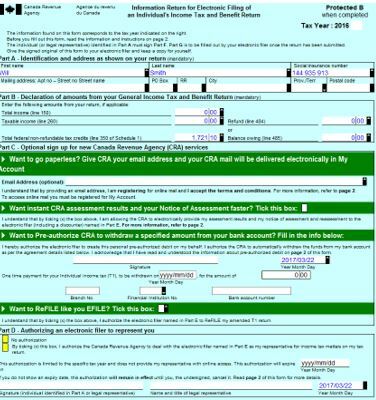 Open a T1 return that has already been filed online, and for which a CRA assessment has been received. ProFile recommends that preparers save the return as a new file, using the "Save As..."option from the "File" drop-down menu in the top toolbar. 3. Enter the new information that mandates a ReFILE into the return. For example, a client has received an unexpected T4 indicating additional income. Note: failing to select the "yes" option will produce an error when attempting to ReFILE. Note: these questions are not mandatory and preparers are not required to provide answers. Any notices related to these questions may be ignored. A valid T1013 form with level 2 authorization must be on file with CRA for any ReFILE web service transmissions. 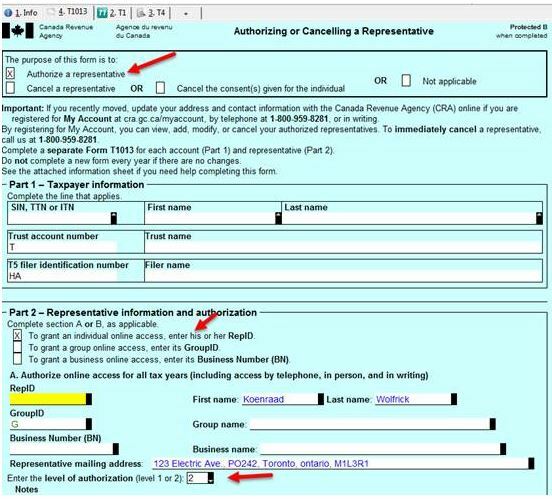 If CRA already has the authorization information on file. another filing of the T1013 is not required: a preparer needs only to fill out the T1013 and select "level 2" authorization. This new designation is permanent and cannot be rescinded from the form. 3. Acquire a new sign-off from the client on the updated T183 form prior to ReFILE attempt. The ReFILE confirmation number displays automatically on the "Info" form related to the return; it matches the number displayed in the ReFILE confirmation message. The ReFILE may be confirmed by examining the history of the return. Select the "Properties" option under the "File" drop-down menu in the top toolbar. Does ReFILE submit only the new and/or updated information added to a return? No, ReFILE will submit new and/or updated information, and resubmit any existing information remaining from the return's original EFILE. Can I use ReFILE for a return after the filing deadline has passed? Yes, a ReFILE will be accepted by the CRA after the filing deadline. Is ReFILE available for Quebec returns? The ReFILE or amendment of a TP1 return is an upcoming ProFile feature; the form TP1FC will be available in our 2018.4.0 release. Can preparers batch ReFILE returns? Returns can undergo batch ReFILE only from Client Explorer. Is it possible to get a summary for changes to a return that were ReFILED? There is no ReFILE summary feature available; it is recommended that preparers save a copy of the original return that was EFILED and also the ReFILED return for comparison. Can I do a ReFILE on a paper return? No, a ReFILE on a paper return is not possible. Does the ReFILE status of a return display in Hub? No, Hub does not current display a ReFILE status. How many times can I undertake a ReFILE for an EFILED return? CRA will accept multiple ReFILE submissions for any single EFILED return. However, the online system accepts only nine readjustments per tax year for each taxpayer, whether the taxpayer, preparer, or CRA initiates the adjustments. If the limit is exceeded, users receive an automated response stating that the limit has been reached. Users can make additional requests on paper, preferably using Form T1-ADJ, T1 Adjustment Request, and mail them to the CRA. 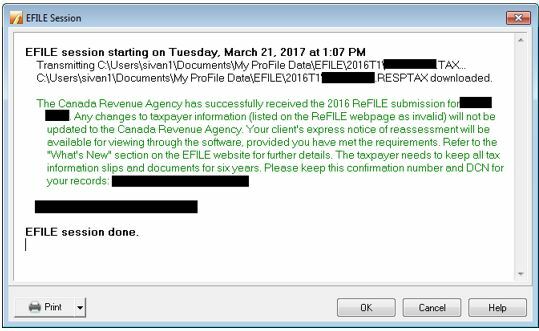 I'm getting an error from the CRA that my EFILE return has not yet been assessed; does this mean I cannot ReFILE? 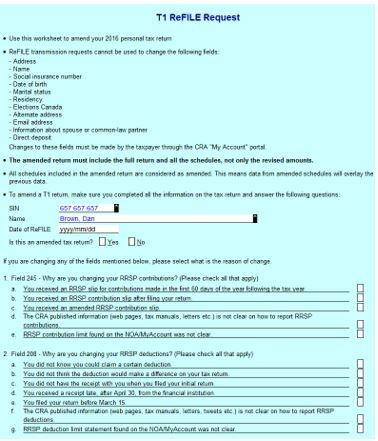 A return that was EFILED must have been assessed by CRA before a ReFILE is possible; check your "My Account" feature on the CRA website for the status? of any EFILED returns. When the initial EFILED return has been assessed, a ReFILE may be undertaken. Where can I get more information about ReFILE? You can visit the CRA's information page about ReFILE here. It includes service exclusions and limitations, as well as restrictions on the use of personal information within the service.